Mister wanted french toast this morning, and I’ll be honest. I didn’t feel like making it. In fact, he specifically asked for coconut flour flatbread french toast, and I had never before concocted such a thing. It sounded amazing, really. It also sounded like a bit more work than what I was feeling up to…being in the throes of a wicked allergy attack lately. I found myself wishing I fed my kids boxed cereal. I was tempted to tell him to go find whatever in the fridge and eat it. But the more I thought about coconut flour flatbread french toast…and a lazy an easy way to make it, the more motivated I became to actually cook something today. So, off to the kitchen I went. It took a couple of tries to get this “right”, but thankfully Mister, my Research Assistant, is always up for helping with the testing and QC phases of recipe development. 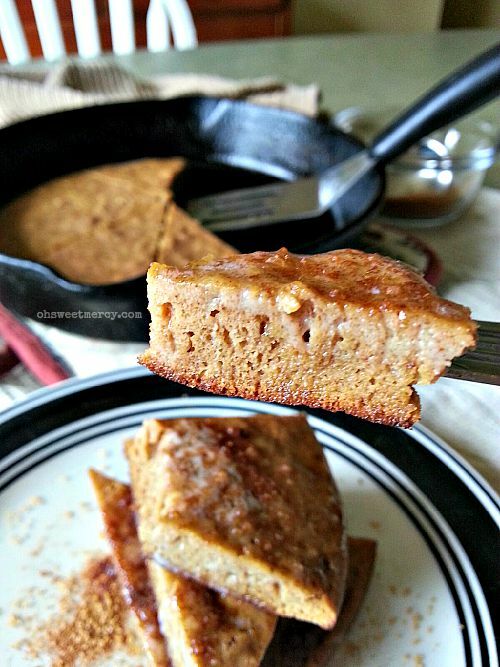 This Spiced Coconut Flour Skillet Cake is grain/gluten/sugar/dairy free. Don’t panic…it is not flavor free at all. It’s lovely with a nice hot cup of tea or your favorite coffee. We don’t have a dairy issue here so we put butter on top of our Spiced Coconut Flour Skillet Cake. But if butter is a no-no in your house, you could spread some delicious virgin coconut oil on top, or even coconut butter. 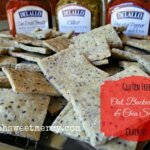 I haven’t tried making it egg free, but you could possibly try it with your favorite egg substitute. I have used this chia egg replacer in other recipes before and it works pretty well. If you’ve made my Homemade Chai Spice Blend, you could use this instead of the individual spices listed in the recipe. Start with a half teaspoon and adjust to suit your tastes. Coconut flour can be a little finicky. The thing to remember about coconut flour is that it is a THIRSTY little guy. It soaks up a lot of liquid and begs for more. I’ve found that the absorbency of coconut flour varies from brand to brand and even lot to lot. 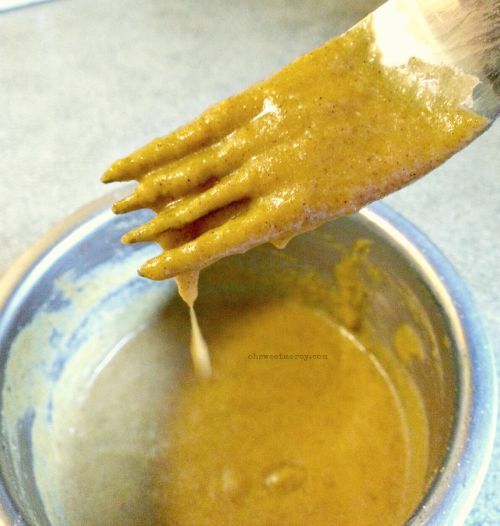 The amount of liquid in this recipe worked perfectly for the coconut flour I have – it’s an organic coconut flour from a local bulk foods store. I don’t know the brand. You may need more or less liquid, but the batter should end up being like a slightly thick pancake batter. The picture below isn’t the greatest but it should give you an idea what your batter should look like. This Spiced Coconut Flour Skillet Cake can be getting in your belly in about 15 minutes. Preheat a small cast iron skillet (mine is about 8 inches across, like this one) while you’re mixing up the batter. When water sizzles and skitters across the surface of the pan it’s good to go. This skillet cake cooks in about 9 minutes on my electric stove with the burner set to medium heat. Top it with butter and some “cinnamon sugar” made with 1 teaspoon of xylitol and 1/2 tsp of ground cinnamon. Or whipped cream. Or stevia-sweetened Greek yogurt. The cream cheese “frosting” I use on my Dark Chocolate Coconut Cake in a Mug would also be delicious. 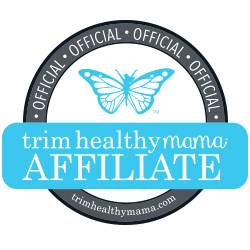 I love not counting calories on the Trim Healthy Mama plan, but here’s some nutrition info if you’re into that sort of thing. This Spiced Coconut Flour Skillet Cake is a nice, solid S recipe. That means it’s higher in healthy fats and low in carbs. This probably falls into the Heavy S range so you won’t want to eat it after a big, fatty meal. If you have it for breakfast, be sure to include a bit more protein with it as it doesn’t quite have enough protein to be considered a meal. Remember you want your meals centered around 20 grams of protein. Eating a half cup of 0% Greek yogurt would do the trick. 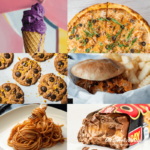 Curious about why I don’t have to count calories and I’m still losing weight? 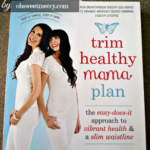 Check out my Trim Healthy Mama Review and my One Year Trimmaversary update! 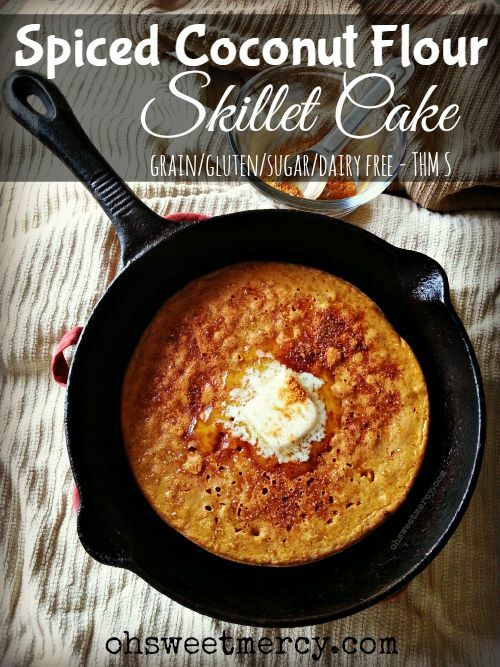 A delicious, low carb, grain/gluten/sugar/dairy free skillet cake that cooks quickly, right on your stove top! Made with healthy coconut flour and coconut oil, it's a delicious and satisfying low carb treat. Preheat an 8-inch cast iron skillet on a low burner on your stovetop while mixing the batter. In a small bowl, whisk together two eggs. Add coconut flour, baking powder, sweetener, spices and sea salt. Mix well, it will become very thick. Add almond milk, mixing gently until smooth. Add more almond milk or coconut flour as needed, in small amounts, until you achieve a thick pancake batter consistency. Add coconut oil and vanilla, mix well. Turn burner to medium heat. When water sizzles and dances across the bottom of the skillet, it is ready. Add about 1 tsp coconut oil to the skillet and coat the entire bottom. After about 3 minutes, cover the skillet with a lid. Cook 9 more minutes, or until completely cooked through. While skillet cake is cooking, mix together the Cinnamon "Sugar" Topping ingredients. Top cooked skillet cake with butter, coconut oil, coconut butter, yogurt, whipped cream or other desired toppings and sprinkle with Cinnamon "Sugar" Topping before serving. Be Sure to Pin This Spiced Coconut Flour Skillet Cake Recipe to Your Favorite Boards! I totally made this for breakfast and it was wonderful. 🙂 Thank you so much for sharing it with us at Savoring Saturdays! I’m featuring it at this weekend’s party. Hope to see you there! 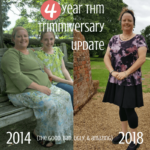 I’m so glad you liked it and that it fits your GAPS diet (as I saw your comment on Instagram). I didn’t have that in mind when I came up with it, but that’s a definite plus. I’ve considered doing GAPS myself but honestly, I’m just not “there yet”. Nice to know that if/when I am, I can still enjoy something yummy. Thanks for sharing! Oooh! 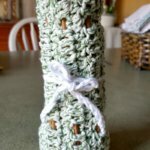 I love the simplicity and creativity of this recipe! The ingredients are ones I use often, and look forward to trying your recipe, as it sounds so yummy! ps: I love your blog name! It’s darling! This is so tasty! I made it this morning, but doubled the recipe & baked it in a pie plate at 400 degrees for about 20 minutes. I’m sure yours was still better with all the caramelization & crispy bits, but for a family serve option, it’s a winner!! I’m so glad you like it! Great idea to double and bake it, thanks for sharing! If you have a cast iron skillet, that would be great for baking in too. made this just now. delicious! Instead of adding extra coconut flour to thicken I threw in about 3/4 cup of leftover squash. Added fiber and sweetness and ended up with pumpkin pie griddlecake…yum. next time I will try this with chinese 5 spice I think. As to your question, I’m not sure…coconut flour can be tricky to work with sometimes. It isn’t an overly thick “cake” anyway, but maybe try a smaller skillet? It may increase the cooking time. Another possibility crossed my mind and that’s your baking powder…is it fairly fresh? You could try increasing that a bit to see if it helps, but too much can leave a bad taste so be careful! Thanks so much for stopping by and giving my recipe a try. I’d love to hear if these suggestions help so please let me know!